"How much candy did you get from that last house, Trent?" laughed Mirk, a Halloween Ixi. "I got the whole load!" Trent snickered. "They weren't home, and just left a bowl of candy out on the porch with a note asking kids to only take one! Haha... suckers!" he said, shoving a handful of candy into his greedy Blumaroo mouth as his Von Roo cape fluttered behind him. "Hey, look over there, guys," said Sakra, a Lenny, who'd dressed as a witch. "Old Lady Doppel over there is giving out some really good stuff. She's half-blind, so I bet we could take a whole handful and she wouldn't notice. Besides, even if she does, we can just outrun her!" The malicious group of friends broke into laughter. "Trick-or-Treat!" 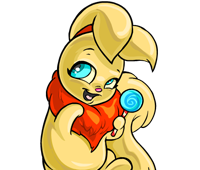 the young Neopets yelled, plastering fake, innocent smiles across their faces as an old Krawk lady opened the door of her Neohome. "My, what frightening costumes you all have!" she said, sounding as if she had already uttered the phrase a hundred times that night. Her eyes slowly wandered to the broken pumpkin that lay on the walkway to her home. The three pets ran up, each snatching a large handful of candy from the Krawk's bowl and quickly stashing it in their bags. The Krawk's eyes narrowed. "My, aren't you hungry?" she said. "You know what? I just baked some fresh cookies... would you three like to come in and enjoy some?" The Lenny was the first to go. Whatever they had suspected, it wasn't this. No subtle tricks, just... Mirk and Trent were off and running, screaming through the house, even as Sakra's green feathers were still drifting down to the damp floorboards. Trent pounded on the window in the bathroom, but it was no use. The latch was rusted shut. He was trapped. He heard the sickly sweet voice of the Krawk calling out for him. "Oh, little Blumarooooo... where did you go?" The voice turned harsh. "Where are you?! You horrible little disgrace to society!" Trent collapsed, shaking violently in the corner beside the toilet. "Ahh, there you are..."
Some say it's just a legend that parents tell their young pets, to make sure they behave on Halloween. There are others who claim it really happened. Everyone agrees, though: You'd best be good on Halloween, because you never know when Mrs. Doppelganger will open her door to you.